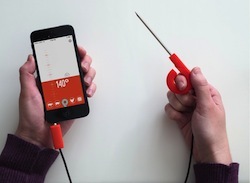 Range Dial: A connected cooking thermometer that lets you unplug. 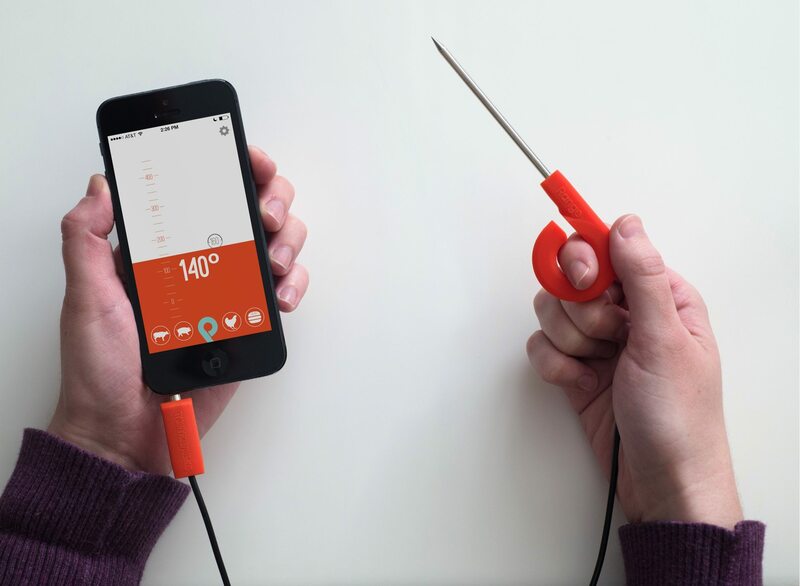 Range Dial is a versatile cooking thermometer that helps you achieve kitchen joy whether it's grilling, baking, brewing, or candymaking. 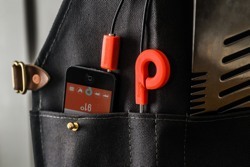 It works with or without your smartphone, so you can tinker with your recipes, not with your tools. Range Dial is the evolution of Supermechanical's previously Kickstarted thermometer, Range. 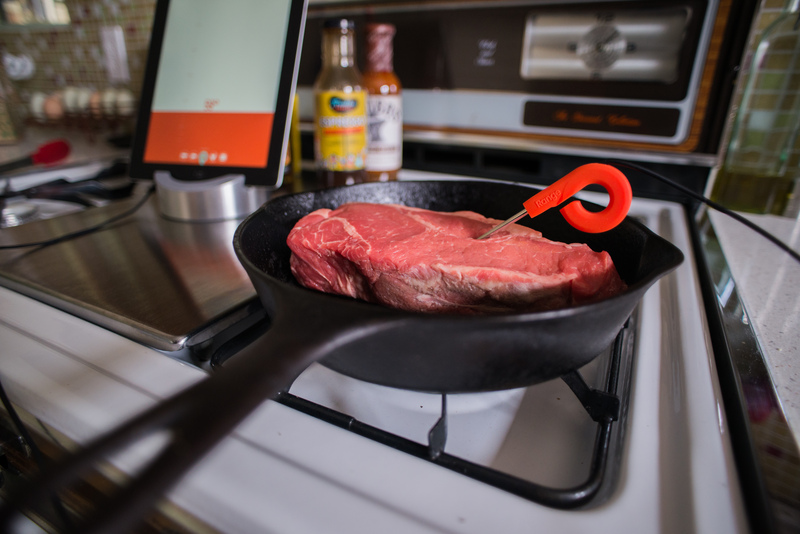 It adds customers' top requests: Bluetooth for wireless monitoring, a second probe for ambient temperature, and live temperature monitoring via the Internet—something unmatched by any other thermometer. But Supermechanical also thought carefully about the friction points and how to address them. 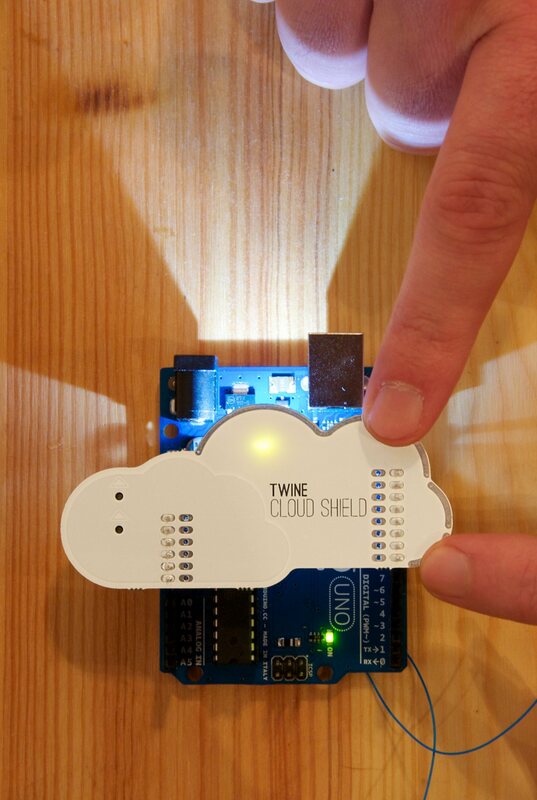 Having a connected device shouldn't mean you have to mess with an app for the most basic functions. 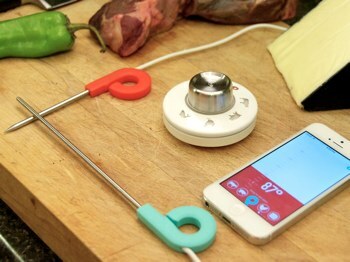 Just plug in the probe and turn the dial to a preset—Range Dial will beep at you, and you'll also get a push notification on your phone when your food is done. 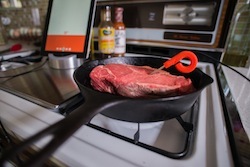 Or open the app to have full control and all the data you need to track your recipe. It's the best of both worlds. Supermechanical paid attention to the details. 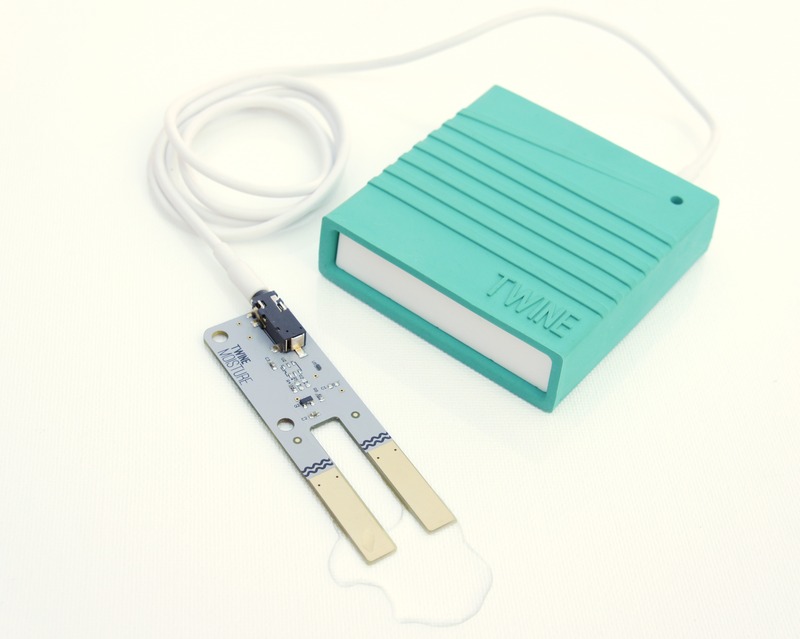 Range Dial is extremely precise thanks to a custom engineered temperature-measuring circuit and probes. 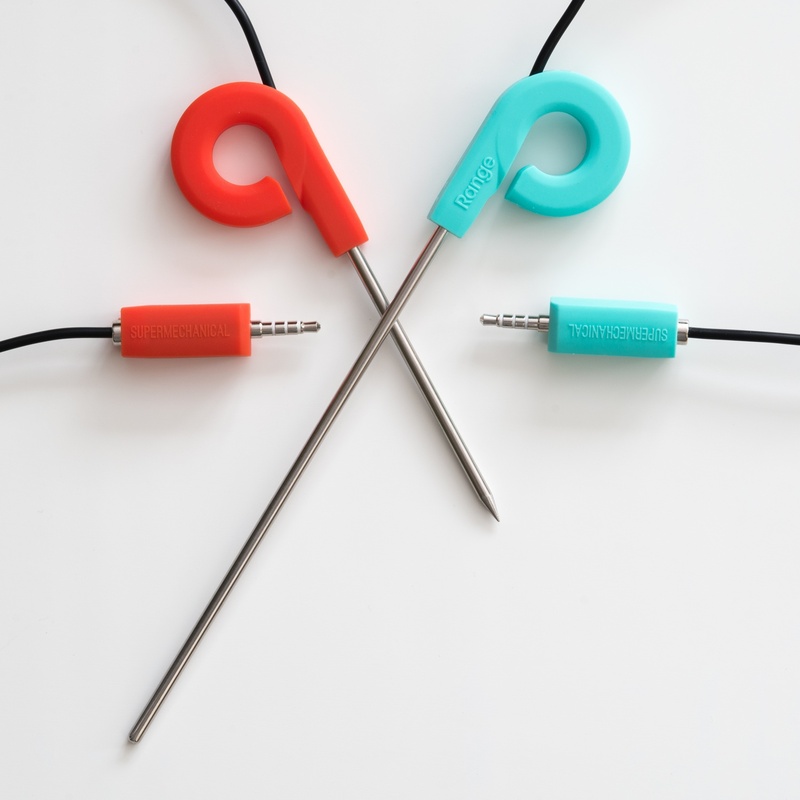 It's built to last with machined stainless steel, silicone and polycarbonate. 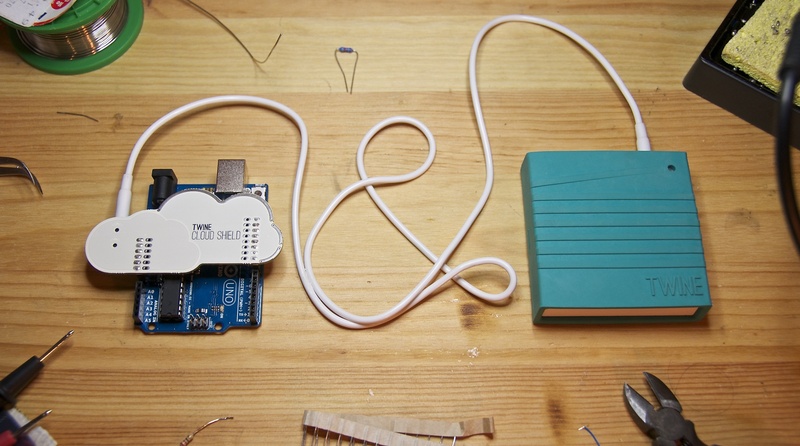 It's the evolution of how hardware for the smart home should look, feel and work. More information can be found at the Range Kickstarter page. 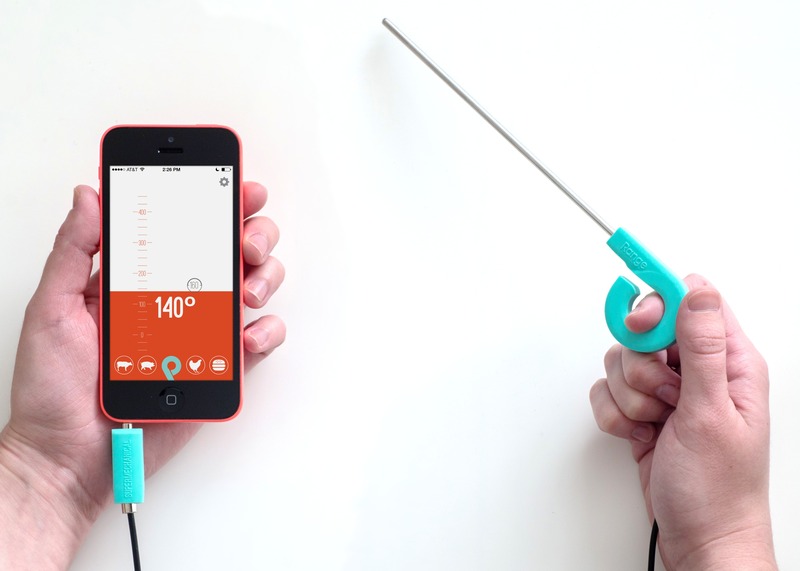 Range: Smart thermometer, smarter cook. 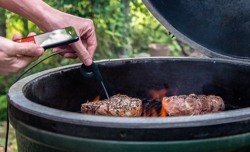 Ember Range has a 3" sharp tip made to slip right into meat, whether you're roasting, barbecuing, grilling, or smoking your dinner. It's short enough to fit in your oven or grill — leave it in or use it as an instant-read thermometer. Aqua Range features a 6" round tip to reach deep into your best pot without scratching it. It's ideal for beer brewing, frying, candy, yogurt and cheese making, or barbecuing an extra large brisket. Both have a food-safe, eco-friendly silicone handle that clips easily on to the side of pots — keeping your hands free for cooking. 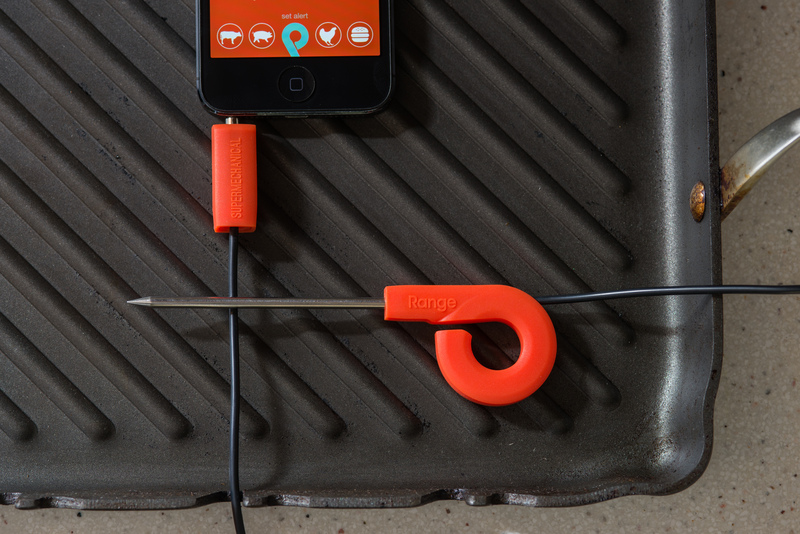 The 54" silicone cable gives you space to keep your iPhone out of harm's way in your kitchen. 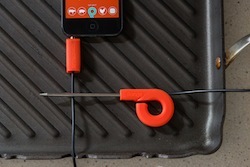 A thoughtful cable magnet keeps the cord under control and stores neatly in the plug when you don't need it. 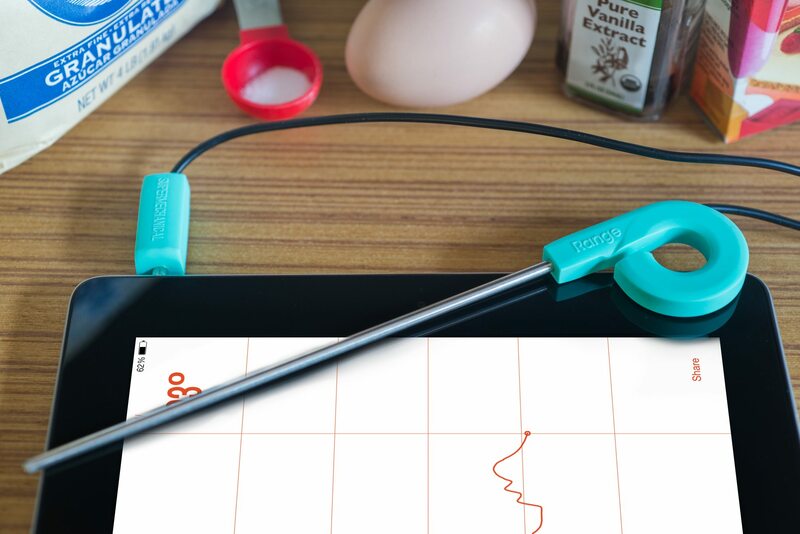 Use Range with your iPad as a leave-in kitchen thermometer and watch the graph of temperature over time. Save the data so you can recall what works and what doesn't for your recipe. 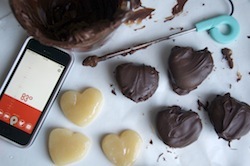 Or, use Range as an instant read thermometer and set alerts to let you know when your candy has hit the hard ball stage. Download the Range app, plug Range into your iPhone (compatible with iOS 5.1+) and you're on your way to your tastiest meal yet. Roast or grill it your way to get as tender as you like without sacrificing food safety. Make perfectly soft-boiled eggs sous-vide style. Explore the hidden world of your brews, confections and meats with the graphing view. 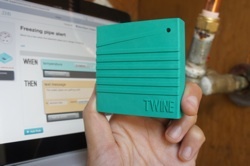 Twine: Listen to your world, talk to the Internet. Twine is the simplest possible way to get the objects in your life texting, tweeting or emailing. Get an email when the basement floods while you're on vacation, a text when someone's knocking at the front door, or a tweet when your laundry's done. 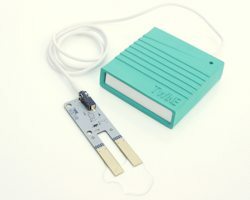 A durable 2.7" square houses Wi-Fi connectivity, internal and external sensors, and two AAA batteries. 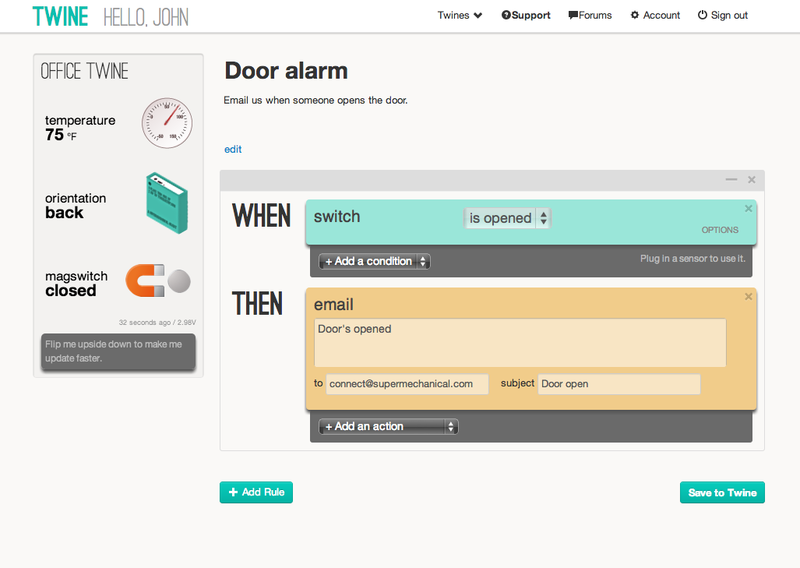 A simple web app allows to you quickly set up your Twine with human-friendly rules—no programming needed. 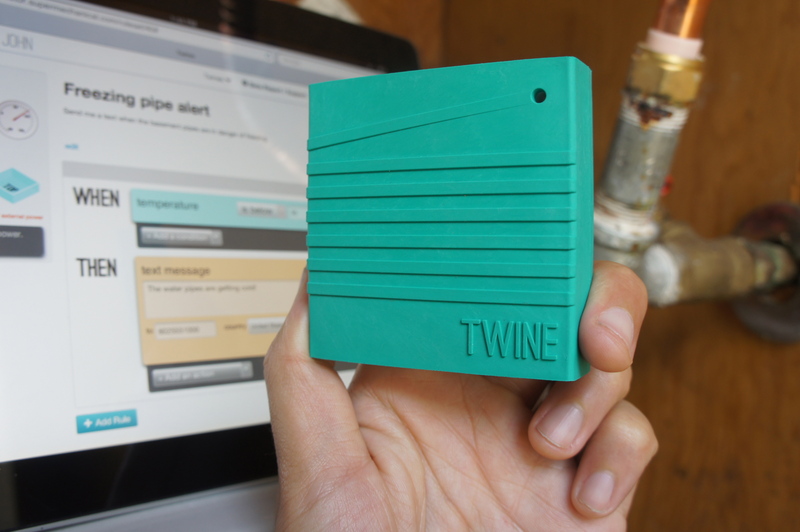 And if you're more adventurous, you can connect your own sensors and use HTTP to have Twine send data to your own app. 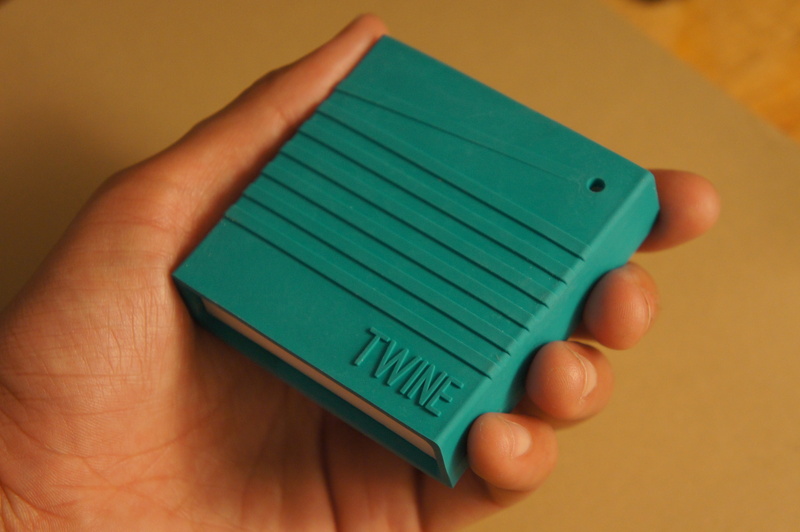 More information can be found on Twine's product page. 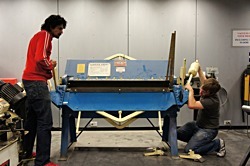 Supermechanical makes everyday objects that connect us. We're designer-engineers who have appeared in all your favorite media, from the New York Times, The Wall Street Journal and Metropolis, to NPR, Wired and Better Homes & Gardens. Our work sprung from the MIT Media Lab, where we researched ways to tame computing in order to make everyday objects better.